Well, we are having a snow storm. Finally! We’ve needed it. We had one a while back but this is supposed to be a biggie. It’s my flyball team’s Holiday Party tonight too, which is kinda funny because last year we had a big storm on party day, too. So now if I had some talking watches I’d be able to remember what time the party is! So of course I had to drag the camera outside because it was pretty when the snow was just starting to accumulate on the grass, and you could see some of the grass peaking through. Tatum and Sasha are becomming good friends. But then, Tatum befriends everyone. 🙂 Tatum is such a good girl. 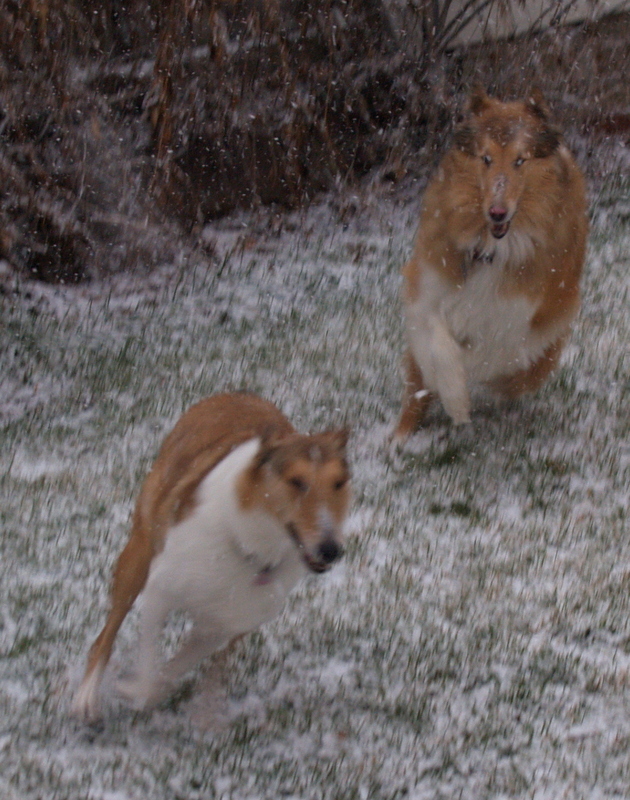 Sasha even chased Tatum around a little bit outside this morning. Zoom Zoom! Sasha is doing really well. She is not coughing as much as she was. She is letting me comb her out just a little bit now and again. Her skin seems very sensitive but that could be due to whatever is on her nose, too. I was able to get some of those tiny pre-mat things out of her right side last night, and her right rear flank. My husband was feeding her treats at the same time I combed to keep her calm and reward her. She stopped taking the treats though, so we stopped the combing too. I think her skin and her coat are really bothering her. Though I think she was groomed fairly recently, because her underbelly is trimmed straight and so are her legs. Her feet are too fluffy though! This picture of Tatum and Sasha running is a bit blurred but it’s pretty darn cute. 🙂 Tatum so loves it when someone will chase her! Sasha’s blood work came back fine, so that’s good. And my husband says that means there’s less chance of her having the really nasty thing wrong. It seems like all three options, below, are really autoimmune things. Sasha is eating really well and I’m glad she is starting to play. I think she’s more of a people dog than a dog dog. She loves to be with me and my Husband. He even thinks she likes him better! Which is just kinda odd becuase it’s more common for rescue dogs to trust women more than men, unfortunately. I know a lot of wonderful men who would never even dream of hurting a dog. Maries last blog post..Zoe’s going to the AKC National Agility Championships! Oh, I love to see Sasha looking so happy in the pictures! I’m glad that she’s settling in so quickly, but it sure makes it hard to let them go. LOL We got snow here today too, but I didn’t get any pictures, I’ll have to try tomorrow. Hi Marie.. Sasha is a very happy girl now. 🙂 She got happy quick, which we like! Looks like Sasha is fitting in really well with your pack. I like the picture of them running! 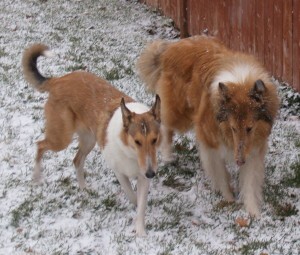 Ahh glad they had fun in the snow. My poor dogs barely got out this weekend. I was just too busy!